Tired by the heat and by watching Glamorgan losing at cricket, and despite being on annual leave, I popped in to the relative cool of the office of the Data Innovation Research Institute at Cardiff University to tidy up a few things. 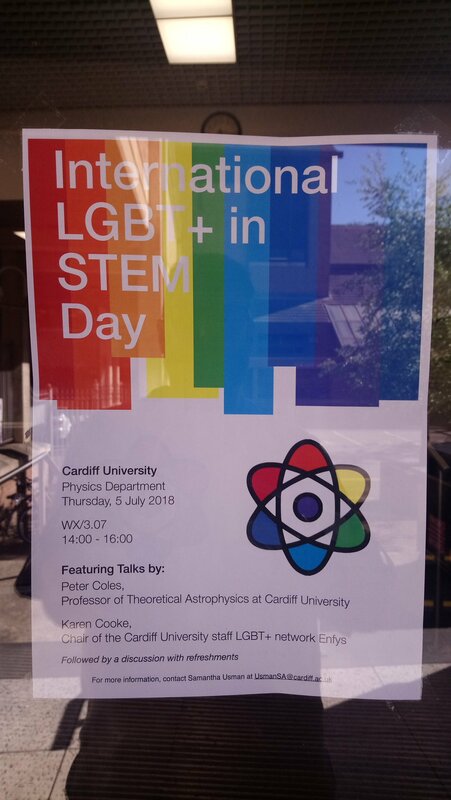 I noticed the above poster on the main entrance to the School of Physics & Astronomy, which reminded me to post a quick plug for the first ever LGBTSTEM Day, which takes place next Thursday (5th July). I agreed some time ago to give a short talk at the School of Physics & Astronomy at Cardiff University about this and am looking forward to returning from Maynooth next week to do so. Many universities and other organizations (including the Royal Astronomical Society) are involved in supporting events on 5th July. If you want to keep up with what’s happening try having a look a the twitter hashtag #LGBTSTEMDay. It’s not too late to put your own event together either! You can find a handy toolkit to help you do it here.